Move the cursor over a picture to see the caption. A click on any of the pictures in the gallery will open a slide show. Those views will also allow you to read some of the exif-data, to see the picture in its full resolution, and to leave a comment. Um die Bildunterschrift zu sehen genügt es, den Cursor über ein Bild zu bewegen. Ein Klick auf eines der Bilder in der Galerie öffnet diese dann als Diashow. Diese Ansichten erlauben es, die Exif-Daten zum Bild einzusehen, das jeweilige Bild in maximaler Auflösung zu betrachten und auch einen Kommentar zu hinterlassen. With this sculpture here, “Willow“, I owe it to Mary, who always is much more attentive than I am and finds interesting aspects, that we could take this picture, which I’d call “I’ll get the moon down from the sky for you“. I believe it’s a fitting end to this walk. Bei “Willow” habe ich es Mary zu verdanken, die immer viel aufmerksamer als ich ist und interessante Aspekte erspäht, dass wir dieses Bild machen konnten, das ich einmal “Ich hole Dir den Mond vom Himmel” titeln würde. Ich glaube, ein ganz passendes Bild zum Ende dieses Spaziergangs. 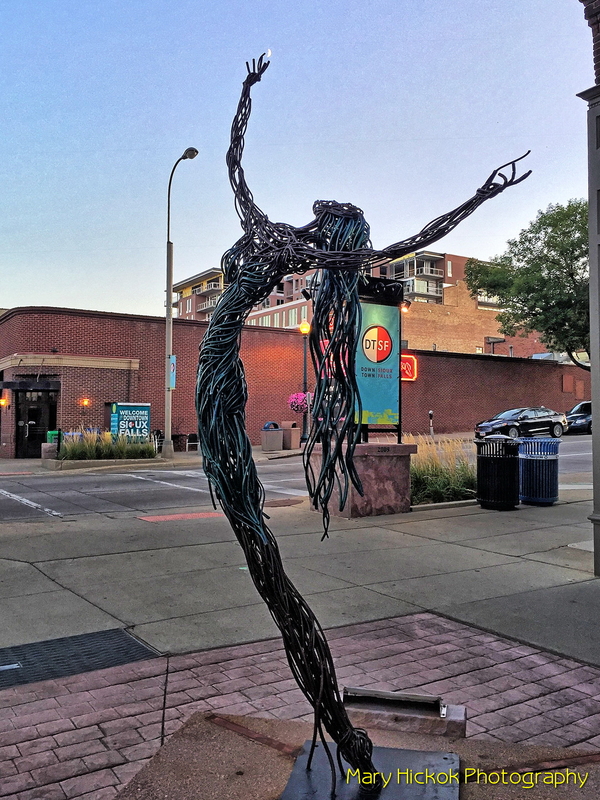 For more about the sculpture walk, check out its website here: Sculpture Walk Sioux Falls. Mehr über den “Sculpture Walk” findet sich auf dieser Webseite hier: Sculpture Walk Sioux Falls. This entry was posted in cities, Day 9, pictures, sculpture walk, sights, Sioux Falls/SD, Sioux Falls/SD, SolarEclipseRoadTrip, travelling, vacations and tagged reisen, sculpture walk, SD, sights, Sioux Falls, SolarEclipseRoadTrip, travelling. Bookmark the permalink. 🙂 Freut mich, das dieser Spaziergang Dir gefallen hat, liebe Mathilda. I always love it when we visit a town with lots of public art, especially sculpture like this. We love that, too. And Sioux Falls really had lots of it – and so diverse! Der war wirklich putzig! Hat mich an unsere Chiquita erinnert. This is a great photo album. It’s wonderful to have a city with all this great sculptures! Even the one that might be the most weird & whimsical, “School Spirit,” is very appealing and I love it! Sioux Falls is smart to invest in this way — I’m much more inclined to visit there now. That city really did a fantastic job with these statues. And they have had this going for so long, with some of the sculptures changing. Well, they can be bought. That may account for the fluctuation. What we liked so much was the diversity. Maybe you should really go there. For a long time, I’ve wanted to do a road trip to Detroit, St. Paul-Minneapolis, and into the Dakotas, etc. But I’m starting a new job pretty soon, and moving to Boston for a while, so for now, I guess I’ll look around New England, instead. Well, for us New England is on the bucket list for a road trip. I really enjoy this sculpture walk. These are very artistic and creative, and so much fun! Thank you for the tour, Pit! Something different. Good to see all that artwork. Rabbit Rock made me laugh. Sioux Falls certainly has changed since I visited in the 60s and 70s. I enjoyed the waterfall photos, and there are some nice pieces here, too. I especially enjoyed seeing the bison. Glad you liked the pictures! Those sculptures were fantastic. A pity we couldn’t see all of them. Das hat mir alles sehr gutgefallen. Ich habe es mehrfach angesehen und irgenwdie gedacht, das man sich so das echte Amerika vorstellt. Hm, das “echte Amerika”? Das kommt mir bei den Skulpturen nicht so sehr in den Sinn. Aber was ist schon “das echte Amerika”? Da hat wohl jeder doch so seine eigenen Vorstellungen. sorry fuer die spaete Antwort: Du warst im Spam gelandet, und das habe ich erst heute mitbekommen. 😦 Freut mich, dass ich Dich hier auf eine schoene und fuer Dich interessante Reise mitnehmen konnte. freut mich, dass Dir meine Berichte gefallen. Schade, dass Du so oft nicht kommentieren kannst! Das ist frustrierend, wie ich aus eigener Erfahrung weiss. Hast Du es mal mit verschiedenen Browsern versucht? Bei mir spinnt z.Zt. mal wieder Firefox mehr als sonst. Wenn ich den – das ist ja mein Standard-Browser – nutze, kann ich auch vielfach weder kommentieren noch liken. Es kann auch vorkommen, dass ich einen Kommentar schreibe, der nicht erscheint, wohl aber, sobald ich mir den entsprechenden Blogartikel mit MS IE anschaue. Dann ist er ploetzlich da. Grundsaetzlich scheint mir MSIE der unproblematischste Browser zu sein. Liegt vielleicht auch daran, dass ich den abolut ohne Add-ons installiert habe. Wie dem auch sei: danke fuer Dein fortwaehrendes Interesse, und toi, toi, toi, dass die Probleme mit dem Kommentieren sich legen. hoffentlich hilft’s! Ich halte die Daumen, denn manchmal kan WP tatsaechlich schon sehr frustrieren. I think I like the bear with the salmon best. Ooh, it’s scary from that angle! WOW. What a cool sculpture walk! Reminds me of Füssen and Aachen where there were loads of street sculptures I couldn’t get enough of seeing. Swoon. Hm, with Fuessen you have the advantage of me. I don’t remember seeing (many) sculptures there. Aachen, yes, I remember sculptures there. Just a few but they were quite memorable. This looks wonderful – I love the “Play With Me” sculpture (not surprising). That last picture is great! For the last pictures I have to thank Mary and her good eye for photographic opportunities. Looks a lot different than my last visit to Sioux Falls in 1973! Would be strange if it didn’t, right? 😀 You’d get something like a Groundhog Day feeling wouldn’t you? Es hat Mary und mir so besonders gut gefallen, dass es so viele ganz unterschiedliche Skulpturen waren. You’re welcome, Jo. We’re always on the look-out for sculptures. Maybe we’ll find some on our upcoming “RailTrailsRoadTrip”. These sculptures really are something, aren’t they? We totally enjoyed our “sculpture walk”.